Celebrating the life of Robert J. Foster Sr.
Obituary for Robert J. 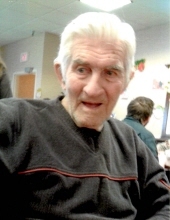 Foster Sr.
LANCASTER, NH – Robert James Foster Sr., 88, died Saturday morning, April 6, 2019, at the Country Village Genesis Eldercare Center, Lancaster. Mr. Foster was born in Bennington, VT, on December 10, 1930, the son of Daniel and Margaret (Mylott) Foster. He was a 50 year resident Bennington where he attended Arlington High School. He served with the US Army and worked all his life as a self employed carpenter. For a time he also resided in the Newport and the West Charleston, VT area before moving to Lancaster. Robert enjoyed hunting and fishing and spending time with his grandchildren. Surviving family members include his four children, Robert Foster Jr. of Shaftsbury, VT, Rosemarie Foster of West Charleston, Mary Way (Frank) of Lancaster, John Foster (Tammy) of Hoosick Falls, NY; 10 grandchildren; 15 great-grandchildren and several nieces and nephews. He was predeceased by his wife Anne Marie (Pinnsonault) Foster; a granddaughter Nicole Harwood; and siblings, Daniel, George, Ed, Fred and Mary Gates. "Email Address" would like to share the life celebration of Robert J. Foster Sr.. Click on the "link" to go to share a favorite memory or leave a condolence message for the family.